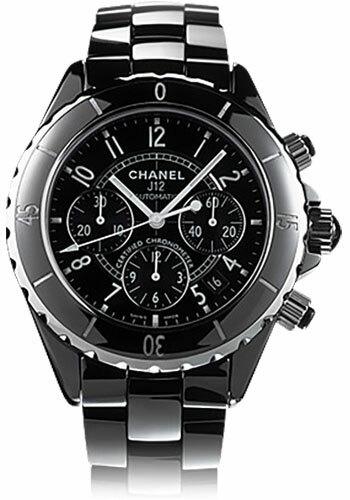 41mm black ceramic case, black dial, automatic winding movement with chronograph function, black ceramic bracelet. 41mm black ceramic case,stainless steel bezel with set with white diamonds, black dial, automatic winding movement with chronograph function, black ceramic bracelet. 41mm 18K pink gold and black high-tech ceramic case, screw-down crown and push-pieces, 18K pink gold bezel set with 48 baguette-cut diamonds (approximately 4.8 carats), black and gold dial set with diamonds, self-winding movement with hours, minutes, seconds (counter at 3 o'clock), date and chronograph (counter at 12 o'clock, 30 minute counter, central seconds), approximately 42 hours of power reserve, ceramic bracelet, triple folding buckle in 18K pink gold. Water resistant to 100 meters. 41mm 18K white gold and black high-tech ceramic case, ogival type screw-down crown and push-pieces, 18K white gold bezel set with 36 baguette-cut rubies (~ 6.9 carats), highly scratch-resistant crystal, diamond pave dial with 264 brilliant-cut diamonds (~ 0.6 carats), self-winding movement with hours, minutes, seconds (counter at 3 o'clock), date and chronograph (counter at 12 o'clock, 30-minute counter, central seconds), approximately 42 hours of power reserve, black strap, ceramic bracelet, triple-folding buckle in 18K white gold. Water resistant to 100 meters. 41mm black ceramic case, black dial with white diamond hour markers, automatic winding movement, black ceramic bracelet.